My gosh this was a busy weekend! 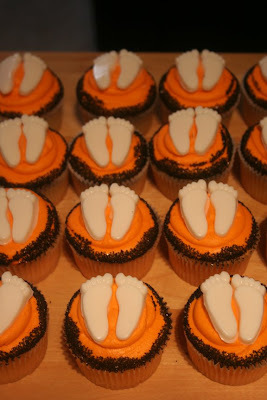 Aside from the 11 cookie cutters and three parties, we had 2 intense cakes and a cupcake order! This first cake was probably one of the hardest cakes we've ever worked on. 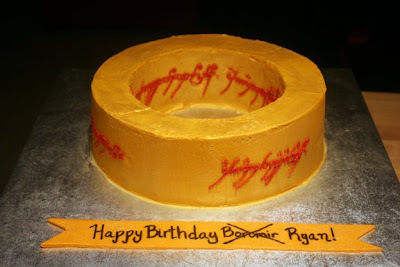 Our really good friend Ryan is a LOTR fanatic and mentioned to me a few months back that he wanted a "ring" cake from the books/movies. I told him we could probably do it and then brushed it aside, thinking he would forget it. He did not forget it. 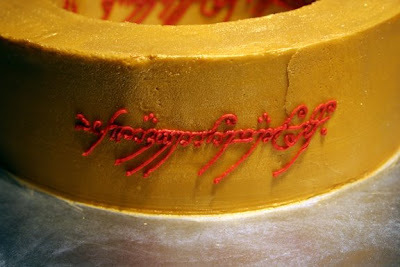 He asked for the ring cake and wanted the elvish inscriptions. But he did not want fondant. Needless to say we had a pretty big task ahead of us. I baked two 10 inch cakes and cut the middle out. I then split the cake in half and iced the inside of each ring. We had taken the inscriptions and blown them up and I used a straight pin to push through wax paper I had placed underneath. I tried pressing the wax paper into the cake to use as a transfer but I could only get parts of letters (is that what they call them in elvish? I have no idea). So I ended up free-handing about 85% of it. Once I had the inside of the ring piped, I pushed the cakes back together, iced the outside and piped the inscription. I brushed super gold luster dust on the entire thing to give it the gold effect. It's not my prettiest cake but you can definitely tell what it is. I would really love to do this cake in fondant at some point. The second cake of the weekend was for our very good friends' daughter, Kaitlyn (she's Rylee's friend too). 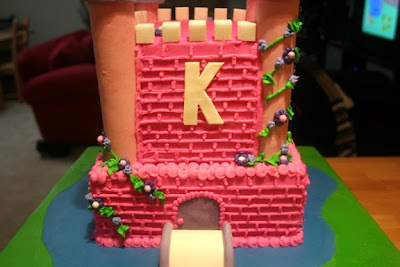 Kaitlyn is turning 5 and really loves all things princess. Her birthday party was a girls only affair and there was tea and lemonade to accompany all of the princess-like activities. Kaitlyn's Mommy (hi Desiree!) chose a cake that she really liked and asked if I could make it. I was excited about this cake because, and I know I have said this time and time again, but I REALLY love makings kids cakes. I made 5 (strawberry) cakes and after they were stacked, Rodney carved down the top to resemble a castle. Earlier in the week we had covered the board in green and blue fondant. We wanted it to look like there was grass and water around the castle. Everything else is pretty self explanatory. The pillars are paper towel rolls covered in fondant. 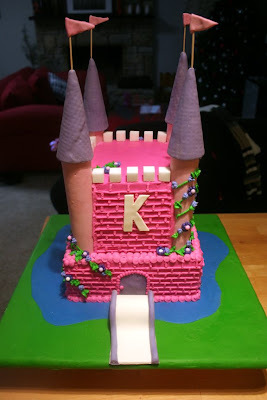 The tops are sugar cones also covered in fondant, the top walls of the castle are sugar cubes, I piped the flowers and vines with buttercream, the door and bridge are fondant. This cake was very labor intensive but it was totally worth it. I loved the way it turned out and I can't wait to make another one! These cupcakes were for a couple that we attend church with. They are having a baby in January and this has to be their 6th or 7th shower! They are having a boy and decorating the room in a Harley theme - they asked that I come up with something that went along with that a little. This is what I came up with! Busy busy weekend! we don't have as many cakes this week but we do have one and a large amount of cookies to make! We haven't even started Christmas shopping yet!